Welcome to West Virginia, land of rugged mountains. 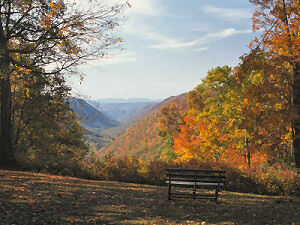 The "Mountain State," with the highest mean altitude east of the Mississippi River, is also the state with the largest single natural scenic and outdoor recreational area in the eastern United States; the Allegheny Highlands. Eighty percent of the state is forested with over 110,000 square miles of hardwood forest, wind-swept mountains and photo-perfect valley landscapes. All of this can be found within a day's drive of 20 major eastern cities. Montani Semper Liberi --Mountaineers Always Free! Until 1863 West Virginia was part of Virginia. Virginia was named to honor Queen Elizabeth of England often referred to as the "Virgin Queen." This nickname refers to the rugged terrain of the scenic Allegheny Mountains that cross the state. This is another nickname given because of the mountainous terrain of West Virginia. Early settlers tended to compare mountainous areas of the new land to the mountains of Switzerland and, so, many states, including Colorado, Maine, New Hampshire, and New Jersey have, at one time or another, been labeled the "Switzerland of America." This nickname indirectly references the physical features of the state. The borders of West Virginia tend to follow the contours of the land, winding between mountains, along mountain ridges, and along river beds. Two long, slender extensions of the state give West Virginia the nickname, "The Panhandle State." The land that extends eastward between Maryland and Virginia is referred to as the Eastern Panhandle. The strip of land that extends north between Ohio and Pennsylvania is referred to as the Northern Panhandle. People who live in West Virginia or who come from West Virginia are called West Virginians. The fifth and final quarter to be released in 2005 commemorates the State of West Virginia. On June 20, 1863, the "Mountain State" became the 35th state to be admitted into the Union, making this the 35th coin to be issued in the United States Mint's popular 50 State Quarters® Program. This coin captures the scenic beauty of the State with its depiction of the New River and the New River Gorge Bridge. The coin bears the inscription "New River Gorge." Prior to gaining statehood, the area that is now West Virginia formed the western part of Virginia. Settlers in the western part of the "Old Dominion" began their efforts to join the federal Union when Virginia announced its secession in 1861. In the western part of the State, the Restored Government of Virginia in Wheeling drafted a state constitution in 1862. The new state called West Virginia applied to Congress for admission into the Union. Congress approved the request with one condition, that the new state abolish slavery. President Lincoln signed the West Virginia statehood bill and on June 20, 1863, West Virginia officially became the 35th state to be admitted into the Union. The design chosen to represent West Virginia is one that combines the natural physical beauty of the State and the triumph of the human intellect exemplified by the engineering wonder that is the New River Gorge Bridge. At 3,030 feet long and 69 feet wide, the bridge is the world's largest steel span and the second highest bridge in the United States, rising 876 feet above the New River Gorge in southern West Virginia. 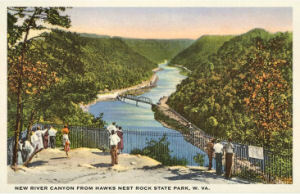 In 1978, 53 miles of the New River was added to the National Park System as the New River Gorge National River. 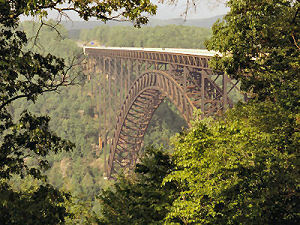 On March 31, 2004, West Virginia Governor Bob Wise announced his selection of the New River Gorge as the design he would submit to Treasury for final approval. The Department of Treasury approved the design on May 4, 2004. More than 1,800 design concepts were submitted from around the State, and students from the Governor's School for the Arts narrowed the field to five finalists. Other designs considered included "Appalachian Warmth," "Bridge Day / New River Gorge," "River Rafters," and "Mother's Day / Anna Jarvis." West Virginia (From Sea to Shining Sea) , by Barbara A. Somervill. 80 pages. Publisher: Scholastic Library Publishing (February 2003) Reading level: Grades 3-5. Presents information about West Virginia's people, geography, history, landmarks, natural resources, government, state capitol, towns and cities, and more. West Virginia (World Almanac Library of the States) , by Justine Fontes and Ron Fontes. 48 pages. Gareth Stevens Publishing (January 2003) Reading level: Grades 4-6. Filled with the most up-to-date information, including the latest Census results. Full-color photos bring to life the story of West Virginia. In addition to an in-depth factual profile of West Virginia in the form of a state Almanac, this book offers fascinating and lively discussions of the state's history, people, geography, government, economy, culture, and lifestyles. A section on Notable People, a calendar of events, and enough primary source documents, time lines, maps, and other tools to make this unquestionably the best young adult reference material on the USA available anywhere. The West Virginia Encyclopedia , Edited by Ken Sullivan. 944 pages. Publisher: The West Virginia Humanities Council; 1st edition (June 20, 2006) Working under the slogan, "All there is to know about West Virginia," the editors packed 2,200 articles into the pages of this big book. These articles are the work of nearly 600 writers, experts in fields ranging from archeology, biography, history and literature, through folklore, culture, and the arts and sciences. The West Virginia Encyclopedia is the state's first comprehensive, one-volume reference book in many decades. The contents are arranged alphabetically and cross-referenced for easy access. Both entertaining and authoritative, The West Virginia Encyclopedia is the place to learn more about West Virginia. West Virginia: A Film History , Special two-DVD set. Running time: Approx. 6 1/2 hours. Publisher: The West Virginia Humanities Council. West Virginia first premiered in 1995 on the West Virginia public broadcasting television network and on public television networks throughout the country. It is an unparalleled saga which reveals the enduring strength and courage of a people who have faced some of America's greatest challenges -- clashes between colonists and Native Americans, the Civil War split from Virginia, the Hatfield and McCoy feud, the drama of the coal and lumber camps, modern labor struggles, and the social crises leading to the 1960s War on Poverty. Narrated by Richard Thomas, West Virginia weaves historic photographs and motion picture footage, quotes from letters and diaries, first-person interviews, and live cinematography into a rich and compelling narrative enhanced by a haunting musical score. West Virginia: A History , by John A. Williams. 239 pages. Publisher: West Virginia University Press; 1st Edition edition (October 23, 2003) John Alexander Williams's West Virginia: A History is widely considered one of the finest books ever written about our state. In his clear, eminently readable style, Williams organizes the tangled strands of West Virginia's past around a few dramatic events-the battle of Point Pleasant, John Brown's insurrection in Harper's Ferry, the Paint Creek labor movement, the Hawk's Nest and Buffalo Creek disasters, and more. Williams uses these pivotal events as introductions to the larger issues of statehood, Civil War, unionism, and industrialization. Along the way, Williams conveys a true feel for the lives of common West Virginians, the personalities of the state's memorable characters, and the powerful influence of the land itself on its own history. West Virginia: A History , by Otis K. Rice, Stephen W. Brown . 360 pages. Publisher: The University Press of Kentucky; 2 Sub edition (September 4, 1994) An essential resource for scholars, students, and all lovers of the Mountaineer State. From bloody skirmishes with Indians on the early frontier to the Logan County mine war, the story of West Virginia is punctuated with episodes as colorful and rugged as the mountains that dominate its landscape. In this first modern comprehensive history, Otis Rice and Stephen Brown balance these episodes of mountaineer individualism against the complexities of industrial development and the growth of social institutions, analyzing the events and personalities that have shaped the state. To create this history, the authors weave together many strands from the past and present. Included among these are geological and geographical features; the prehistoric inhabitants; exploration and settlement; relations with the Indians; the land systems and patterns of ownership; the Civil War and the formation of the state from the western counties of Virginia; the legacy of Reconstruction; politics and government; industrial development; labor problems and advances; and cultural aspects such as folkways, education, religion, and national and ethnic influences. For this second edition, the authors have added a new chapter, bringing the original material up to date and carrying the West Virginia story through the presidential election of 1992.